This page is about the lens reversal technique, a very popular close-up technique in the good old days. 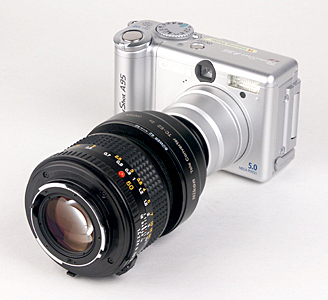 The effectiveness of this technique can be proved easily: if a lens of focal length X (in mm) is reversely mounted on a lens (on camera) of focal length Y, the combo will have a magnification of Y/X. 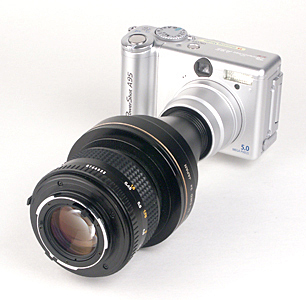 Thus, if a 50mm (resp., 25mm) lens is reversely mounted on a 200mm (on camera) lens, the combo will yield a magnification of 4X = 200/50 (resp., 8X = 200/25). This is the easiest way to increase magnification. Unfortunately, small sensor digicams usually cannot take advantage of this technique. For example, the Canon A95 has a focal range of 7.8mm and 23.4mm. If a 50mm lens is reversely mounted on a A95 with the lens set to the wide angle 7.8mm (resp., telephoto 23.4mm), the magnification is 0.156X = 7.8/50 (resp., 0.468X = 23.4/50). This is not very impressive compared with the use of some close-up lenses. See here for more details. To increase the magnification, one must increase the focal length of the camera lens. For example, if a 2X (resp., 3X) telephoto converter is added to an A95, the longest focal length becomes 46.8mm (resp., 70.2mm), and the magnification will be 0.936X (resp., 1.4X). Normally, we would not be able to get exactly as the calculation tells due to many parameters (e.g., the gap between the camera lens and the reversed lens). Therefore, this page tries to collect some data for the lens reversal technique for the A95. The first and most important item is a good 35mm SLR lens. Normally, 45mm to 60mm and large aperture f/1.4 to f/2 would be sufficient. Lenses that are flat field are even better. Large aperture is important because the lens is usually used wide open to avoid vignetting. 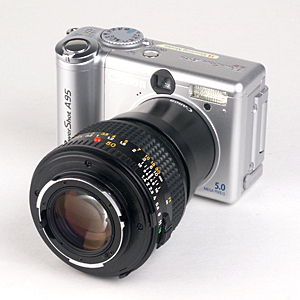 We shall use a Minolta MD 50mm f/1.4 to take example images. Since the diopter of a lens is 1000/(focal length), mounting a 50mm lens in front of the camera lens is equivalent to the use of a +20 = 1000/50 close-up lens! Therefore, high magnification is expected. We also need a macro coupler and a few step rings. A macro coupler is a ring with male threads, and a step ring has one male thread and one female thread. Since the Minolta MD 50mm f/1.4 has a 49mm thread, and the Canon LA-DC52D adapter tube has a 52mm thread, a 49-52mm macro coupler is required. 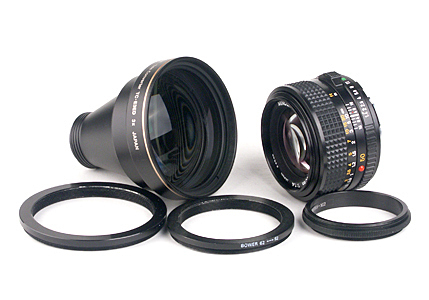 The image below shows a Canon adapter tube, a 49-52mm macro coupler and a Minolta MD 50mm f/1.4 SLR lens. Screw the 49mm end of the macro coupler to the Minolta lens and the 52mm end to the Canon adapter tube, and we have the combo as shown in the left image below. The right image shows the combo on a A95. How to Use This Combo? 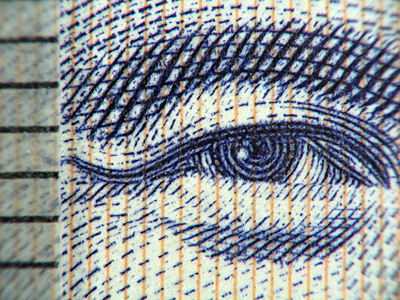 The reversed lens is usually set to infinite focus because this setting usually yields the best results, and focusing with the reversed lens is not needed. 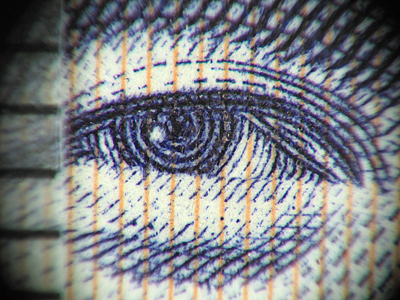 Note that non-macro lenses are calibrated at infinite focus, and image quality gets worse in close range. The aperture is wide open as mentioned earlier. Since depth of field is very shallow, smaller camera aperture should be used. The minimum focusing distance is approximately the focal length of the reversed lens, and the combo usually cannot focus at infinity. In other words, this combo can only be used in close range! Moreover, the camera lens should be zoomed all the way in for maximum magnification and avoiding vignetting. 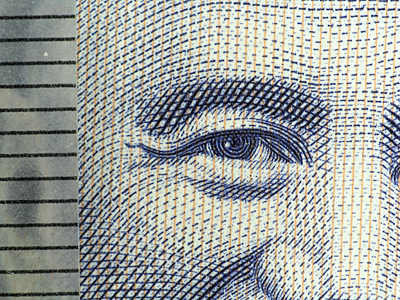 The image below was taken with A95 and a reversed Minolta 50mm f/1.4. 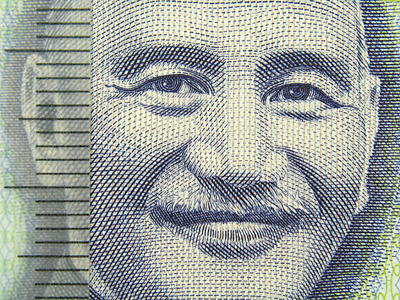 The minimum focusing distance is about 1.25in. The recorded length is 13mm and, consequently, this Minolta combo has a magnification of 0.41X, very close to the theoretical value. This is an expected result, because the Minolta lens is a +20 diopter close-up lens! Although it is not easy to see the quality difference between this and that of the Hoya, the 100% crops show that the reversed Minolta has a much better quality. Compared with the Raynox MSN-500's result, this Minolta still wins since the edge portion of the Raynox image is soft and less contrasty; however, this comparison is not entirely fair because the Raynox has a higher magnification. It is interesting to point out that from the magnification value one can compute the diopter of a close-up lens. For example, the Raynox MSN-500 has magnification 0.76X at A95's maximum focal length 23.4mm. Since (focal length of A95)/(focal length of Raynox) = 0.76, we have (focal length of Raynox) = 23.4/0.76 = 30.8mm and the diopter of the Raynox is approximately +32.5 = 1000/30.8. Reversing a Minolta 50mm f/1.4 only yields a magnification of 0.41X. Can we obtain a higher magnification, say 1:1 life-size? We have two options: (1) increase the focal length of the camera lens, and/or (2) decrease the focal length of the reversed lens. Option (2) is a little difficult to achieve because reducing the focal length of a reversely mounted lens could easily cause vignetting. Thus, it is very likely that Option (1) is the only alternative. 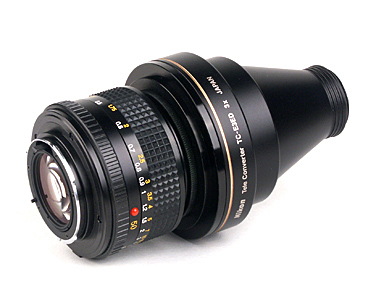 The easiest way to increase the focal length of the camera lens is adding a good teleconverter. Otherwise, chromatic aberration, soft corners and lower contrast can easily be seen from a poor teleconverter. Fortunately, Nikon have two very good teleconverters: the TC-E2 2X and TC-E3ED 3X. They are the best 2X and 3X teleconverters on the market for small size cameras. 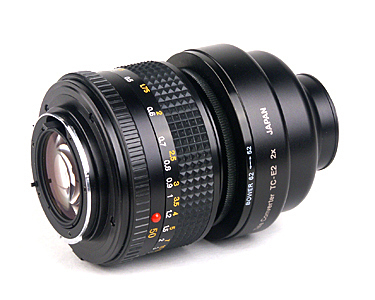 Since the TC-E2 has a 62mm front thread and a 28mm rear thread, a 37-28 thread converter is required to use it with the LensMate 37mm adapter tune. Moreover, we also need to go down from 62mm to 49mm. The left image below, from left to right, shows a Nikon TC-E2 2X converter and a Minolta 50mm f/1.4 on the back row, and a 52-49mm macro coupler and a 62-52mm step-down ring on the front row. The left image below shows the TC-E2 plus Minolta 50mm combo on an A95, and the right one shows the actual shot. The vertical coverage is about 7mm, and the actual magnification is 0.76X = 5.319/7, which is equal to that of the Raynox MSN-500. Note that the focal length of the A95 plus TC-E2 is 46.8mm = 23.4 x 2, and the theoretical magnification is 0.936X = 46.8/50! This discrepancy may be due to the space between the reversed lens and the Minolta, and the less power of TC-E2 when focused at close range. Virtually all lens characteristics are calibrated at infinity, and you might not see full power (i.e., 2X of a 2X telephoto converter) at close range. Comparing this and the result of the Raynox MSN-500, this lens reversal result is sharper in both center and edge, although more testing would be required to make a definitive answer. 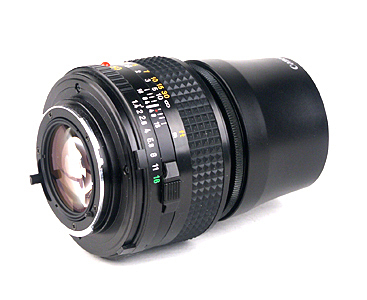 The TC-E3ED has a 72mm front thread and a 28mm rear thread, a 37-28mm thread converter is also required to use it with the LensMate 37mm adapter tune. Moreover, we need to go down from 72mm to 49mm. 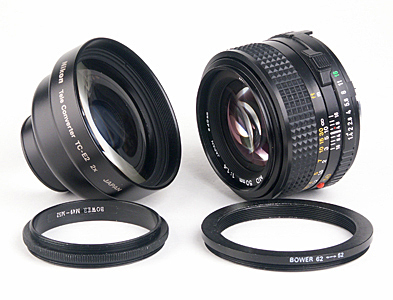 The left image below shows a TC-E3ED (left), a Minolta 50mm f/1.4 (right), a 72-62mm and a 62-52mm step-down rings, and a 52-49mm macro coupler. 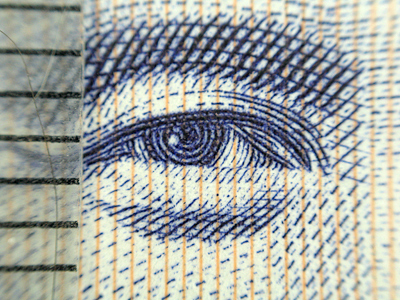 The right image shows the TC-E3ED on a Minolta 50mm. Please notice two important facts. First, the TC-E3ED front element is very large while that of the Minolta 50mm is relatively small. As a result, the TC-E3ED may see a portion of the Minolta's lens barrel, causing vignetting. Second, the gap between the front lens elements of the TC-E3ED and Minolta is larger than that of the TC-E2 case. 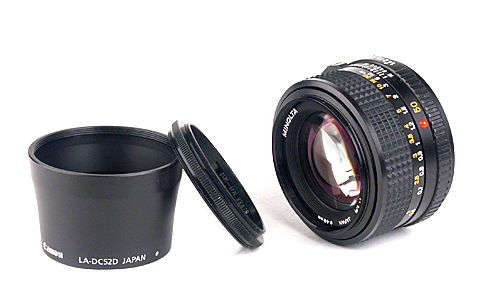 This means the Minolta 50mm is pushed away from the TC-E3ED, another possibility of vignetting. The left image below shows this big combo on an A95. Finally, the right image is the actual shot. It has vignetting as anticipated. 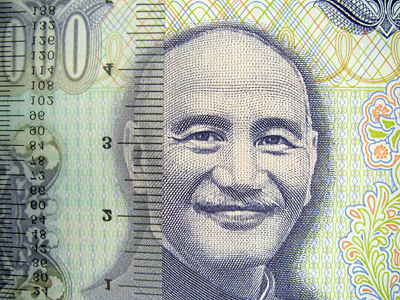 The recorded vertical length is 5mm, making the magnification slightly higher than life-size: 1.06X = 5.319/5, although the theoretical magnification is 1.4X = (3*23.4)/50. The center sharpness is very good, although the corners are a bit soft. If cropping is acceptable in your work, this TC-E3ED plus Minolta 50mm combo may be an easy way for 1:1 life size macro photography. We certainly can replace the TC-E3ED with cheaper 3X converters; however, optical quality could be compromised. A not-so-good 3X teleconverter can generate a significant amount of chromatic aberration. The following table summarizes all findings on this and the previous close-up pages.